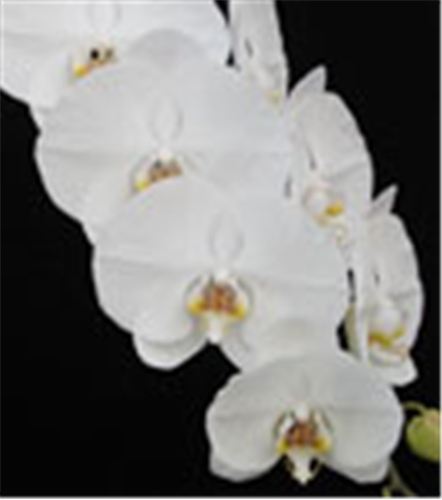 A spectacular result of Norman's selected line breeding, this clone received a Silver Medal at the 16th World Orchid Conference in Vancouver, BC in 1999, having the additional honor of being the only white Phalaenopsis awarded there ! Producing gracefully tall and dramatically cascading spikes, its pristine white flowers are the ultimate in exceptional size, form, texture and substance. Little wonder that it’s our most popular white Phal ! Please note: If ordered in flower, this plant must be shipped in a very large box, necessitating a greater shipping charge to be added to the plant. Very Highly Recommended !